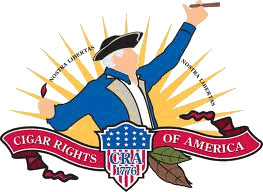 As a supplement to our Cigar of the Week segment on Half Ashed, Craig and I are offering up a weekly Epilogue Review as well. 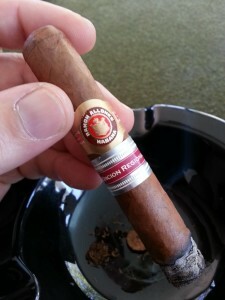 This week, we took a look at the Ramon Allones Eminencia (2005 Edicion Regional – Switzerland). Every CotW for the first six months of shows will be a cigar that one of us really enjoys, and that the other may or may not be familiar with at all. In keeping with what is becoming tradition, I will be furnishing this brief review as I have never had the pleasure of smoking the Eminencia. I smoked the first example of this cigar earlier in the week leading up to the show. Giving it an initial once-over, I notice it has a quite dry wrapper – not in the sense that it isn’t properly humidified; just dry to the touch and devoid of any perceptible sheen or oils. I notice neither soft nor tight spots, and no voids. It feels evenly packed throughout its length. I detect very little in the way of wrapper aroma, but at the foot it is noticeably cedarlike in character. It’s what I suppose I would call a corona gorda, being about 5 5/8″ X 44 ring. The unlit draw provides a slight tartness, tempered with a sweet cedar reminiscent of the abovementioned aroma at the foot. The draw is a bit tighter than I would typically prefer, but within the normal range. Upon first light, I am amazed at how readily it took to fire. It seemed to “want” to be lit, lighting very quickly and evenly (as Craig would later say during the show….nothing Half Ashed about it). The early flavors are a bit of white pepper – not exceedingly spicy; in fact, I find the provided spice very pleasant. It is tempered with the sourness I was getting before lighting. To avoid confusion, I want to point out that this sour, or tart, flavor description is not meant to imply anything negative or offputting. I find it enjoyably mouthwatering. My experience with Cuban cigars is very limited, but this sweet and sour interplay is exactly what I think of as the prototypical “Cubanesque” profile. The burn continues with its early perfection throughout the cigar, with only one minor touchup about halfway through when it developed a hint of a scalloped edge. In all likelihood, this would have self-corrected. But, being a bit obsessive with burn, I went ahead and preemptively trimmed it out. At about the halfway point, I picked up on a bit of the sweet spice I’ve mentioned before. It reminded me of a sweet paprika, but was very fleeting. Going into the final portion of the cigar, it developed an occasional woodsy character that would send my memory to a very specific time of life. I spent many years working in furniture plants, and at one time the company I worked for produced hardwood flooring. The woodsy flavor in this cigar immediately took me back to this time, and specifically when Walnut flooring was being planed or tenoned on the production floor. The aroma then was very similar to what I perceived toward the end of the Eminencia. It was as crisp and clear a memory as I think I’ve ever drawn from a smoke. As I wrapped up the final inch of smoking, the Eminencia was less “mouthwatering” than earlier, and produced considerable dryness on my palate. It maintained some of the earlier sweet spice, but became more of a “bright” earthiness – not the typical damp hardwood forest floor earthiness, but lighter and less pungent. Overall, the Eminencia was another home run from Craig. I truly enjoyed this cigar. Given the opportunity, I would probably choose the 1998 Montecristo Especial we smoked a couple weeks ago over today’s cigar, but would never shy away from this one at all. In fact, if by some outlandishly odd circumstance you had the opportunity to pick some of these up, I would heartily recommend you do so. They are an outstanding way to spend a couple hours…. If you’d like to find Episode 005, where we discuss this cigar and other news, you can find that information here.